T-cells are one of the immune system's major weapons. They detect the body's cells infected with a virus and trigger their ablation, effectively killing the virus. T-cells cannot do the same with cancer cells, however, as they do not recognise them as foreign cells and are therefore unable to eliminate them. But researchers have recently used T-cells engineered in the laboratory to combat tumours. Modified to include additional functions, these immune cells can hunt down and kill cancer cells. Unfortunately, however, such immune cell therapies can have significant side-effects. On top of that, the production of modified T-cells is technically challenging. 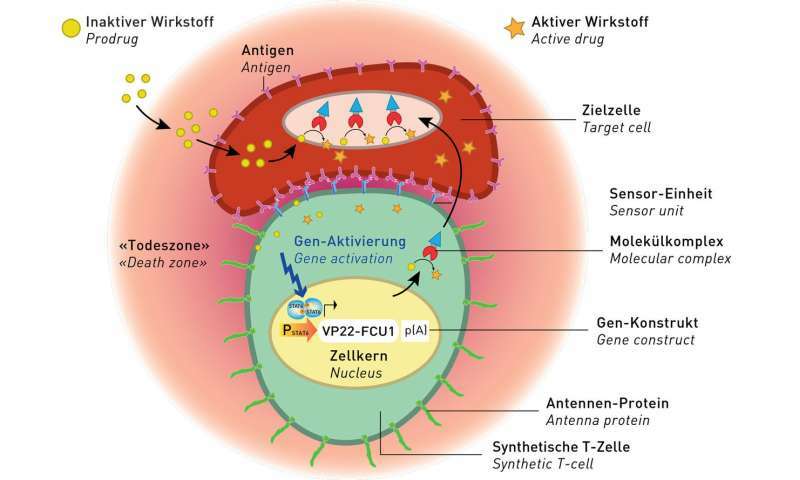 Now a team of researchers led by ETH Professor Martin Fussenegger from the Department of Biosystems Science and Engineering (D-BSSE) in Basel has come up with an innovative and simplified approach for producing therapeutically effective synthetic designer cells to combat cancer. The researchers have built three additional components into human renal cells and (adipose) stem cells, thereby transforming them into synthetic designer cells that mimic T-cells. One of the components of synthetic T-cells entails molecular antennae protruding well outside the membrane. Also embedded within the cell membrane are antibodies with specific docking sites, which can sense the target structures of the cancer cell and bind to them. The third component is a gene network that generates a molecule complex. This molecule complex comprises a molecular "warhead" that penetrates the membrane of the target cell. It is linked to a converter molecule that activates an anti-cancer substance in the tumour cell's interior. The precursor of this active substance needs to be added to the system externally. Cancer cells absorb this substance, and the converter module transforms it from an inactive to inactive state. The cancer cells bursts, the active substance is released and destroys other tumour cells in the "death zone" around the synthetic T-cell. "This bystander effect makes our synthetic T-cells even more effective," Professor Fussenegger explains. The mechanism triggering the signal cascade leading to the destruction of the cancer cell is new, and has a physical function: as the synthetic T-cell moves closer towards the target cell, the antennae proteins buckle. The antennae's anchorage deep within the cell therefore loses contact with a molecular switch that it had previously blocked. As a response to the "ON" command, a signal cascade is initiated which actuates the production of the molecule complex. The new type of artificial T-cell has several advantages over current cancer treatments. Whereas during chemotherapy the body is flooded with active substances in order to kill as many rapidly dividing cells as possible in a very unselective manner, only a few artificial T-cells are needed in the new therapy. What's more, these are only deployed locally and in a carefully targeted fashion. "Our innovative T-cells may detect and kill metastasising cancer cells at a very early stage, when other treatments are not effective," Professor Fussenegger says. Another benefit: "The artificial T-cells operate totally independently from the body's immune system, enabling it to continue to function perfectly normally, so that fewer side-effects are likely." In addition, the modular design of the system allows it to be expanded. Researchers can equip the artificial killer cells with different types of docking sites that bond to other types of cancer cells. For the current study, just published in the journal Nature Chemical Biology, scientists used docking sites that detect only one specific type of mammalian cancer cell. "This technology provides us with an enormous degree of generalisation that cannot be achieved with the genuine T-cells used in current cancer therapies," Fussenegger stresses. It's still not clear whether - and how - this system will function in the human body. So far, ETH researchers have only tested their new cells in cell cultures. "At present our new system is still a long way from a therapeutic application," says the ETH professor. "But I believe we have opened up a new front in the battle against cancer."